*****Featured as one of the 10 Great Gifts for Travelers by Forbes***** *****Featured as one of the 10 Best Travel Tips of All Time by Condé Nast Traveler***** No more need to worry if your flight will be smooth! 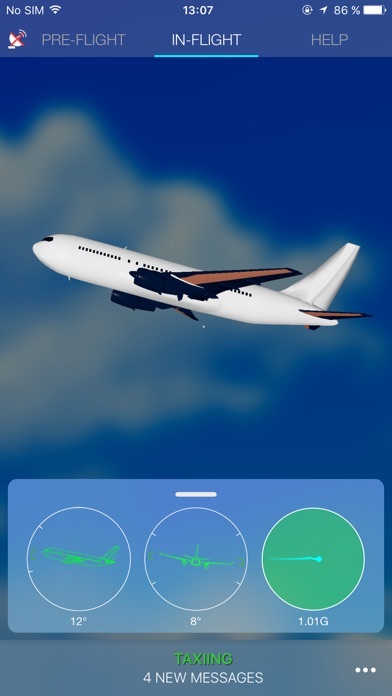 • SOAR In-Flight researches your flight. • As you fly, SOAR In-Flight tells you when turbulence will begin, how long it will last, and when the flight will be smooth again. 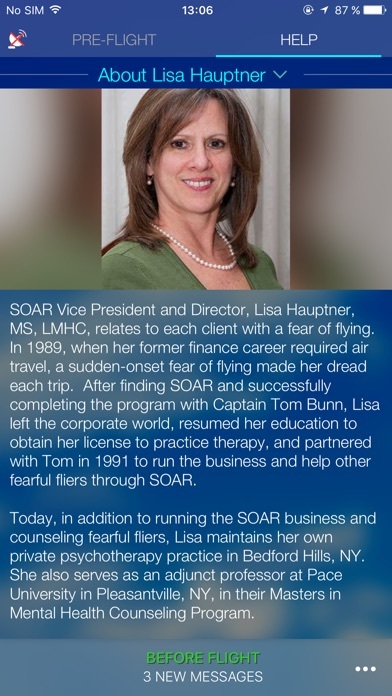 • While not a course, SOAR In-Flight is the perfect complement to the SOAR Program and an excellent tool to take on your flights. It's like sitting next to a pilot with access to complete flight data! 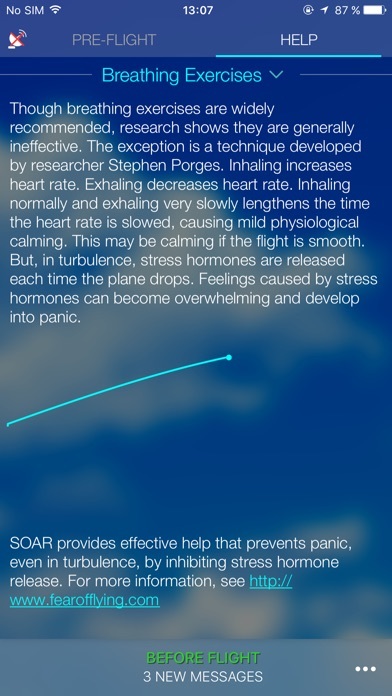 SOAR In-Flight explains every sound as you hear it, and every sensation as you feel it. SOAR In-Flight is able to do this by combining data from professional sources used by airlines with information from your iPhone sensors. No wifi or GPS required on board. SOAR In-Flight accompanies you through your entire journey, explaining everything that is going on, as it is going on. 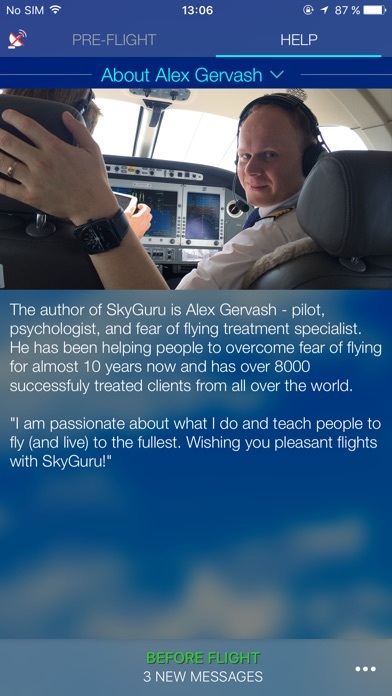 This amazing app was created by professional pilot and fear of flying therapist Alex Gervash. --------- Available for free: - Aviation weather forecast and its explanations for departure and arrival airports. - Turbulence forecast for the shortest route between two airports. Available with flights purchases: NEW! Interesting facts about the points of interest that you are flying over; NEW! Offline map, showing an approximate location of your airplane and route. This location is calculated and does not require GPS or internet. NEW! GIF images illustrating how airplane mechanisms work in real time. NEW! Seat recommendations on board according to aircraft’s sunny / shadow side and a possibility to see a beautiful sunset / sunrise. - Forecasts of most turbulent areas en route, including approximate time of entry into and duration of each. - Description of weather conditions at the departure and arrival airports and explanations of how they may affect your sensations. - Calculation of the actual flight time considering current winds already 24 hrs prior to your flight - Real time explanations of most sounds and “dipping / falling through” sensations which could worry the passengers. - Warnings about higher probability for going around due to current weather conditions. - Turbulence graph and current G-force values created by turbulence, as well as their difference from the overloads that the airplane is meant to withstand. 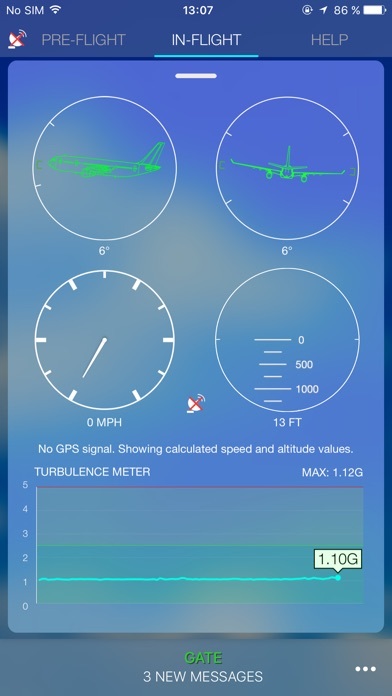 - Flight speed and altitude, given a stable GPS signal (usually, available at a window seat). - Airplane’s nose positions relative to the horizon and airplane’s maximum bank angles when entering a turn. - 3D airplane model of its relative position in space considering banks and turbulence. - Notification about expected manoeuvres soon after take-off and shortly before landing. - Explanations of cabin procedures that passengers often wonder about, such as: “why does the light blink,” “why do we open window blinds”. All in real time. - Unique helpful methods and exercises that to assist passengers in overcoming fear and making their flight more comfortable. --------- IMPORTANT NOTES! 1. Speed and altitude are only available with GPS signal. 2. 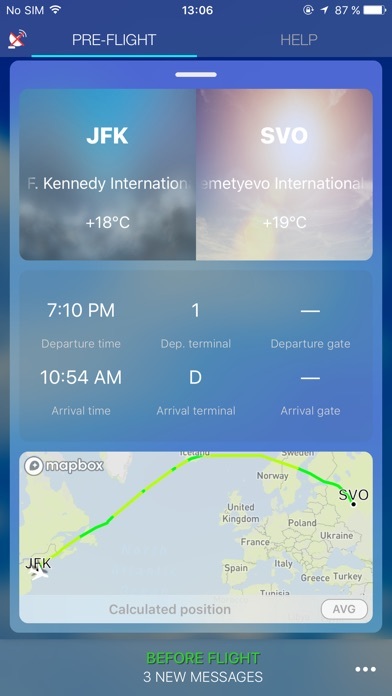 The app is designed to be used ONLY on a REAL flight. 3. If you have any questions, we are always happy to assist 24/7.. Please contact our support BEFORE submitting a review. 4. Continuous use of GPS when running in the background can dramatically decrease battery life. App was fine until take off then crashed every time I launched within 10secs of launch. Paid for a 10pk and the company was terrible to help with a refund. Don’t waste your time! 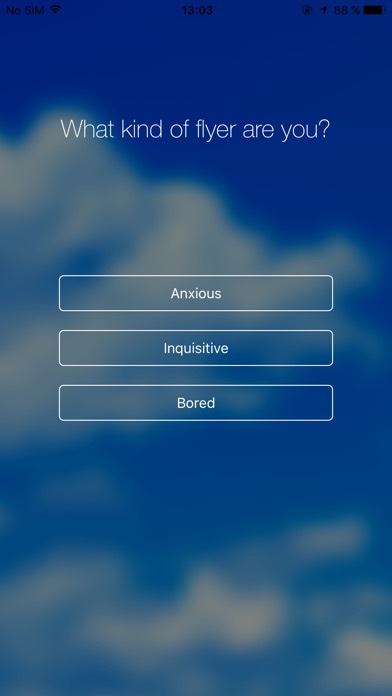 Great App for Anxious Fliers! This app is excellent! 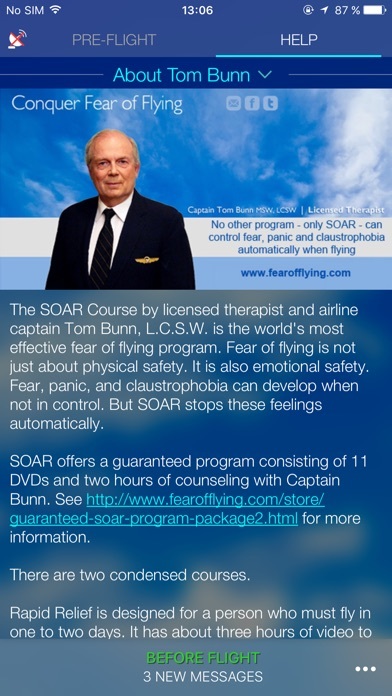 I have done the SOAR course and it made a huge difference in my fear of flying. However, using this app is like having Captain Tom right there with you during the flight. The tips, I do and encouragement really help and the g-meter, speed, altitude and attitude gauges are really cool to watch. They prove everything Captain Tom tells you in the SOAR courses. The app isn’t perfect though. But it will help you. My phone never got GPS reception the entire flight even though I had a Window seat so speed and altitude were a bit off as expected. But given it was working off of calculations it was relatively close. I have read the book “SOAR,” and this was my first time using the app. A 90-min flight with, what the app told me, would have a 35-min zone of light-moderate turbulence. All the updates and the notes about what were flying over really helped calm me. I was actually able to get some work done - even with some bumps! I’ll be using this all the time.